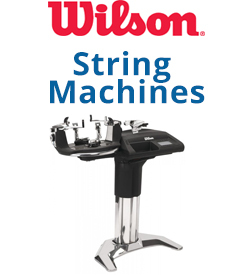 Investing in a tennis stringing machine, as with any large investment, requires consideration of cost, frequency of use, and styles and features of each machine. The number of times you should re-string your tennis racquet in a year is the same number of times you play tennis a week; however, if you like playing with spin, you may need to increase that number. If you are hitting the courts only once or twice a week, you may find it more cost effective to take your racquet to the local tennis shop for an annual or semi-annual re-stringing. Inversely, teaching pros or families with several enthusiastic players needing to re-string several tennis racquets several times a year, may consider the cost effectiveness of investing in a tennis stringing machine. Babolat specializes in electronic tennis stringing machines. The Babolat Sensor Dual tennis stringing machine is loaded with features! Preferred by shops and stringing pros alike, the sturdy, lightweight and quality construction of this machine is what makes the revolutionary Babolat mounting system top of the line. A more manageable solution for traveling stringers or home court owners is the Babolat Star 5. It features the same innovative clamp and mounting system yet stands on a smaller base and lacks some of the more complex programming features. 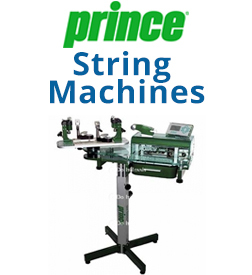 Prince machines are available in both electronic and manual styles. The Prince NEOS 1500 is a manual tabletop machine that has a 5 star rating for ‘Ease of Use’ by the United States Racquet Stringers Association. It is portable and lightweight, with a quick and secure 4 Point Mounting and dual swivel double action clamp. The Prince NEOS 1000, the smallest stringing machine in the Prince line, has a 4 star rating for ‘Ease of Use’ by the United States Racquet Stringers Association. Designed for maximum ease and speed, this manual machine is easy to set up and you can re-string your racquet in 30 minutes. The Prince 5000, a four point mounting system and the Prince 6000, a six point mounting system, are both electronic tennis stringing machines and offer advanced programming features which provide accuracy, speed and quiet operation. 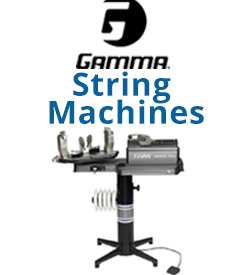 Gamma has been making a high quality line of tennis stringing machines for more than 25 years. Ranging from manual tabletop to fully loaded electric, most Gamma machines feature a 6-point mounting system and diamond dusted clamps that reduce string marking. The 8500 Els comes with a digital control panel that has one touch programming. The Gamma X Els is a tabletop electric tennis stringing machine that features all the same technology as the standing models, just without the base. The Progression Els features a 360 degree turntable rotation with locking brake and optional foot pedal switch for “Hands Free” operation. Two point mounting systems are recommended for standard sized tennis racquets while multi point mounting systems are recommended for oversized tennis racquet users. The advantages of additional mounts are less pressure on the racquet’s frame during re-stringing, which reduces the chance of racquet distortion and uneven string tension. Swivel clamps, preferred by stringers of other racquet sports because of their flexibility, require the most effort since each clamp must be secured individually, but the freedom of stringing patterns may be worth the extra bit of effort. 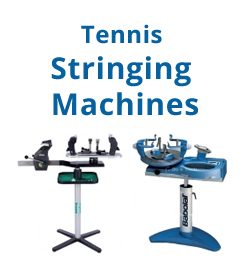 Glide bar and clamp system tennis stringing machines are the preferred method for home or inexperienced stringers as they are quick and simple to use. The teeth on the glide bar clamp are situated so that tension is applied equally to the clamp and the glide bar. This type of clamp pulls the string in one direction while holding it securely with the other. Floating clamp tennis stringing machines are the least expensive of the clamping methods and the least accurate. Since the clamps are not attached to the machine, they do not guarantee even tension. Floating clamps do offer more freedom in their stringing pattern however. 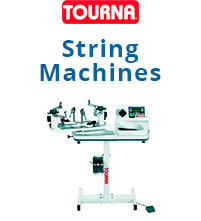 The spring loaded stringing machine is the easiest system to use. The disadvantage of this system is the lack of steady pull on the strings which may allow some stretching resulting in a slightly lower tension than with other machines. Electronic stringing machines are the favorite of teaching pros and are becoming more affordable as technology offers less expensive options. All of the stretch is removed from the strings providing accurate tension every time. Programming options make stringing different sized racquets, one after the other, a quick and uncomplicated process. The drop weight system is the most accurate of methods because it removes all stretch from the string, however, this manual system it is not recommended for inexperienced stringers.